It is a great pleasure for me to come back to Wales during March, a month of budding spring. As the saying goes, "March wind and April showers brings forth May flowers". I hope my visit will bring Wales a Chinese breeze that will bring forth the blossoming of China-Wales friendship and cooperation. Just as here in Wales you have your red dragon, China is known as the country of the dragon. Our economic growth is sometimes described as the dragon roaring. Indeed, the last 3 decades have seen China roaring ahead with double digit growth. This resulted in China overtaking Japan as the world's second largest economy. So, what has made the China's success possible? There have been a number of contributing factors. First and formost, our reform and opening-up have unleashed creative and productive forces that have steered the country onto a route of development which suits our national conditions, along with the hard work and ingenuity of the Chinese people. "The Chinese Worker" was named by Time magazine as "Person of the Year 2009", the only group of people to have shared the title. The magazine commented, "the tens of millions of workers ... are leading the world to economic recovery". The Chinese workers were also listed as one of the World's Most Influential Players in 2010 by the American SmartMoney magazine, as they "make up one of the most potent forces in the world economy". Some may be concerned that such fast rate of economic growth is unsustainable. However, their concern will be eased with a better understanding of China's development. China is in the process of industrialisation and urbanisation. Its modernisation is irreversible. Given its large population and vast market, its economy promises huge potential and broad prospects for continued growth. The Chinese National People's Congress is currently reviewing the 12th Five-Year Plan. This is China's economic and social blueprint for the next 5 years. The plan will give priority to ensuring sustainable fast economic growth and social harmony. To this end, China will speed up the upgrading of its growth model and economic restructuring to raise the quality of development. China will also strengthen social programmes to improve people's living standards, expand reform and opening-up and improve governance. The best way to overcome "growing pains" is to keep growing. China serves as a driving force for global economic development. Its contribution to global growth was 50% in 2009 when the financial crisis was in full force. This figure was still as high as 20% when countries slowly emerged from the crisis in 2010. Statistics show that each percentage point of China's growth drives growth in medium and low-income countries of 0.34 and 0.2 percentage points respectively. China's economic progress is an engine of growth for exports and investments by foreign businesses in China. With 1.4 trillion US dollars worth of goods imported in 2010, China is now the world's No. 2 importer. As China stimulates domestic demand and consumption, it is well on the way to becoming the largest consumer market in the world. China has attracted over 700 billion US dollars of foreign investment over the past decade. This has enabled foreign businesses to be very much part of China's development and they have shared in the growing boom of the Chinese market. China's opening-up policy will continue unchanged. However, China's market is not free of competition. The fittest and the favourites are emerging industries such as high-end manufacturing, services, energy-efficient, environmental-friendly and high-tech sectors. Businesses which contribute to pollution and which are energy consuming will have no place. China's economic growth has invigorated Chinese businesses into "going-global". This has contributed to economic and social progress and job creation across the world. Last year, China invested almost 60 billion US dollars overseas, ranking first amongst developing countries. In 2009, overseas branches and subsidiaries of Chinese companies paid a total of 10.9 billion US dollars in local taxes and hired a local work force of 438 thousand people. Chinese businesses have also played an active part in the development of local infrastructure. Over the past decade, they have helped build 60 thousand kilometres of road and 70 million square metres of housing across Africa. Research by the Financial Times shows that in the past two years, China has given record loans of 110 billion US dollars to other developing countries, which is more than the World Bank. In summary, China is following a win-win opening-up strategy and is committed to sharing development and prosperity with the rest of the world. Business cooperation is the bedrock of China-UK relations. We have seen ever deepening and expanding business cooperation between our two countries in recent years. Our trade in goods exceeded 50 billion US dollars last year, and an ambitious goal was set to double trade in the next 5 years. The UK is also one of the leading EU investor in China. Chinese businesses from banking, insurances, to telecommunications and the automobile companies have increased their presence in Britain. And this has resulted in China becoming the 6th largest investor in the UK in terms of number of projects and the No 2 investor in London. China and the UK should draw upon their complementary strengths and encourage businesses to work together to explore cooperation in new industries such as low-carbon, bio-tech industries, new energy and material and information technology. We need to identify flagship projects, foster synergy amongst SMEs between the advanced technologies and low cost, and ensure that we create a better investment climate for businesses of both countries. 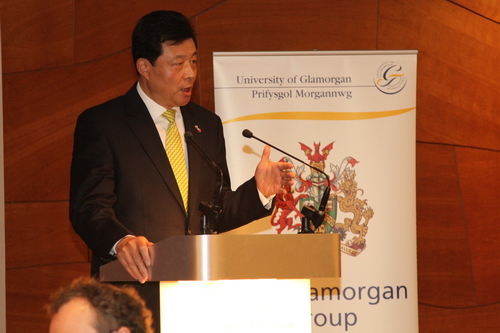 In the context of our booming China-UK cooperation, the cooperation between China and Wales enjoys a solid foundation. There is a long history of links between Wales and China, with Cardiff and Xiamen becoming the first British twinned cities in March 1983. 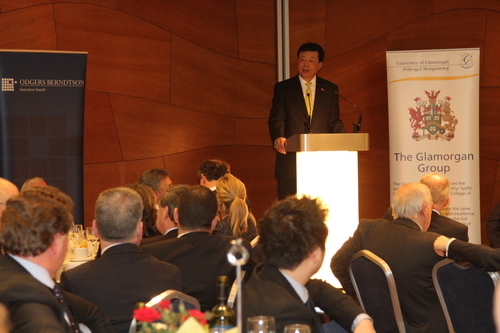 In recent years we have also witnessed close exchanges and productive cooperation between Wales and Chongqing. Wales is blessed with a first-class business climate in Europe, boasting scientific strength and a talent pool of R&D professionals and skilled workers. Wales has the lowest crime rate in the UK. It has stunning natural landscape and great cultural heritage. Not to mention its reputation of being the "Land of Song", and as I am sure we all know, the place to get delicious, mouth-watering lamb! 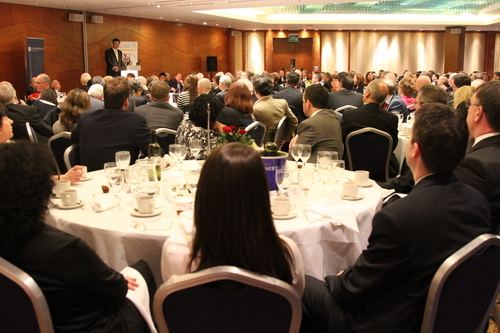 All go to making Wales a desirable investment destination. I do hope all of you as business leaders play your role by exploring the Chinese market and attracting Chinese investment. 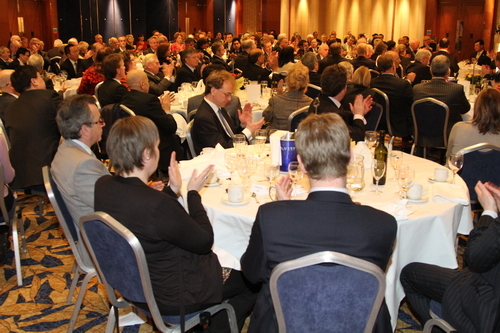 We need your help to take our trade and investment cooperation to a new level. A Welsh proverb tells us, "Scatter with one hand, gather with two". I am confident that as long as we deepen our friendship, work hard to strengthen our partnership, we will gather fruits of cooperation with two hands. And our two "dragons" will not only dance to the same tune but will prosper together. Diolch yn fawr (Thank you).